Home > Brands > IAC Industries, Inc.
We represent IAC Industries, Inc., a leading manufacturer of industrial workbenches. The goal of IAC Industries is to improve the organization, function and atmosphere of its customers' production and assembly work areas, inspection stations and research laboratories. Their products offer the advantages of ergonomics, modularity, adjustability and durability that cannot be duplicated in ordinary office furniture. IAC manufactures 100% of their products in the United States where all processes meet or exceed industry specifications for quality. IAC's manufacturing facility meets Class A specifications, with in-house operations for sheet metal fabrication using dedicated tooling, frame welding, laminating and finish, and a state-of-the-art powder paint bay. Whether selecting standard or customized models, IAC workstations offer the best value now and for years to come. Please call us at (800) 416-9243 or email sales@ergonomic-solutions.com to discuss your requirements and we can help configure a workstations that meets your needs. The IAC Basic Workmaster™ Stock Bench offers a broad selection of easy-to-assemble workbenches for assembly, lab and technical environments. Each of the pedestals on the IAC Dual Pedestal Workbenches offer multiple drawer and locker combinations. The Workmaster Storage Cabinet Workbench by IAC offers wide, large-capacity drawer pedestals. The IAC Dimension 4 Workstations are the most versatile and useful workstation modules available. The system easily expands to meet growing needs through the addition of accessories and more modules. This unique Pro Series 930/940 Adjustable Height Workstations are designed with pleasing contemporary and rugged functionality for its user. Cantilever styling eliminates front supports for greater leg comfort and unobstructed movement. The IAC Single Pedestal Workbench features a single pedestal on either the right or left side, these workbenches supply generous storage, ideal for assembly, lab and technical environments and they also make a great choice as a shop desk. 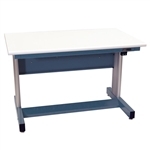 Sometimes called work tables, stock bench, assembly bench or working benches, IAC’s E Series workbenches offer a broad selection of easy-to-assemble, industrial workbenches for assembly, lab and technical environments.